I used High Hopes "Farm Background" and coloured it with Copic Sketch Markers. I use my blender pen a lot for colouration. I teared two pieces of Su's kraft cardstock and one wild wasabi for the ground. I added 3 Prima flowers for the "spring" touch :) The sentiment is also from High Hopes. Thanks for your visit enjoy the evening! Ich habe High Hopes "Farm Hintergrund" verwendet und mit Copic Sketch Markern coloriert. Den Copic blender Stift verwende ich sehr viel für meine Colorationen. Für den "Boden" habe ich zwei Stück "kraft" cardstock und 1 "wild Wasabi" von Stampin' Up gerissen und übereinander geklebt. Die 3 Prima Flowers habe ich für den Frühlingshaften touch hinzugefügt. Der Text ist ebenfalls von High Hopes und bedeutet "Ostergrüße"
Gorgeous card Katharina! 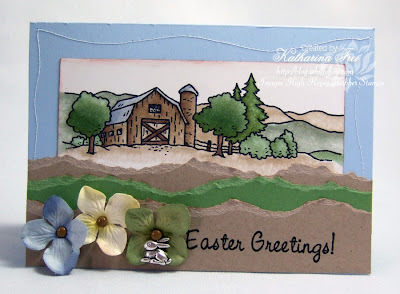 Love how you used the teared cardstock, and the colouring looks beautiful. Fab stitching too! Love your fabulous colouring and your tearing and flowers are just perfect! Very lovley card! It can be so gorgeous even if not using patterned papers! And you are very good at it!! This is so beautiful Katharina! You are the only one I know who can make a barn look beautiful, girl!!! I love the torn paper, looks like hills. Gorgeous!